For the architecture lovers...introducing the "Fourth Grace"
I found this while reading news about my favorite soccer club: Liverpool FC. Anyways, I think this design is spectacular. This is the winning design for the 4th important building in the famous Liverpool Pier Head. Thus the name "Fourth Grace". Edit: The design itself is called "The Cloud" and it's by the Alsop Consortium (Will Alsop). I can't say I love it, but how can you "criticize" someone who is pushing the building and design boundaries like this? Here are some pics. If you have any other spectacular/weird/innovative designs you want to share, please post them. 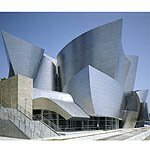 Btw - gotta love Gehry's Walt Disney Concert Hall in LA. At first it looks a bit boring but it's a work of genius. It's nice. I drove by it the other day and just had to park my car to admire it. It stands out. I'm trying to get tix for a concert. I hear the accoustics are supposed to be amazing. The interior designed by some Japanese accoustics wizard or something. To be the devil's advocate, while it may be a very original design, it seems too amorphous a shape to me (unlike all the other designs shown so far on this page). There's no distinct facade or balance to it. Just seems like a blob on stilts.